You can install your own DSL lines in your home and connect them to your ISP's network interface box. Only a few basic tools are needed, and the parts are available at home-improvement stores. You will need some twisted-pair Ethernet cable, some RJ45 jacks, and one DSL filter for each telephone. Your voice lines and Internet connection share the same cables. You can put an Internet connection anywhere you can put a phone, and vice-versa. It's the phone company's property and responsibility up to the network interface device, and from that point on it's all yours. Beware: Junk call blocking services like NoMoRobo may not work on DSL. My parents recieve several Medicaid scam calls every day because they are stuck with a Frontier DSL landline. Frontier apologizes but says they can do nothing, even though most of the calls spoof Caller ID from the same faked +1-317-999-xxxx block of numbers. DSL stands for Digital Subscriber Line. It's a way of combining traditional audio signals for the voice calls with digital communication for an Internet connection. The telecommunications company enables DSL on your line, and then it's your problem to get the higher frequency digital signals from the company's box into the house and to your computers. The phone company has a line running down the street. It might be an overhead line running from pole to pole, but in newer areas it may run underground. The drop is the line from the telephone company's line into the residence. The term "drop" is getting to be old-fashioned, referring to the days when all the telephone lines ran overhead from pole to pole and the line into a residence literally dropped, running from high on a pole to the exterior wall of the house and then down into the interior wiring. 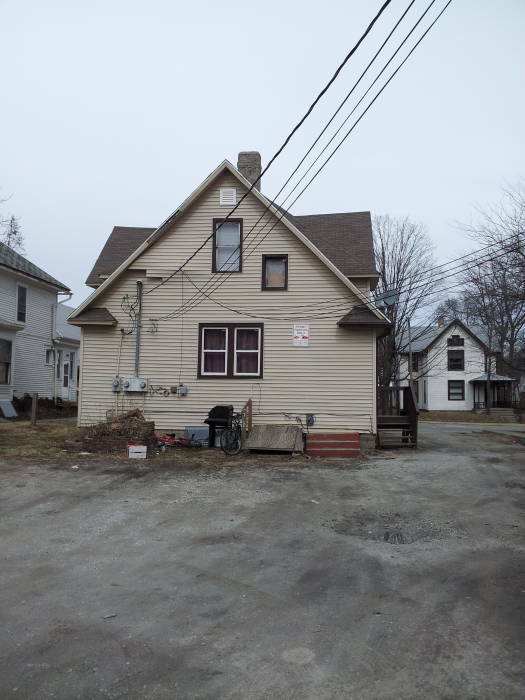 Today's drop might be the old-style overhead line suspended from a pole to the exterior wall of the house, as seen here. Below we see electrical power on the left. This house is divided into three apartments, so there are three electrical meters. The black cables at center are for cable television. The phone company drop is at right. The straight black line running down the wall is the drop from the phone company. The large grey square box is the interface box. 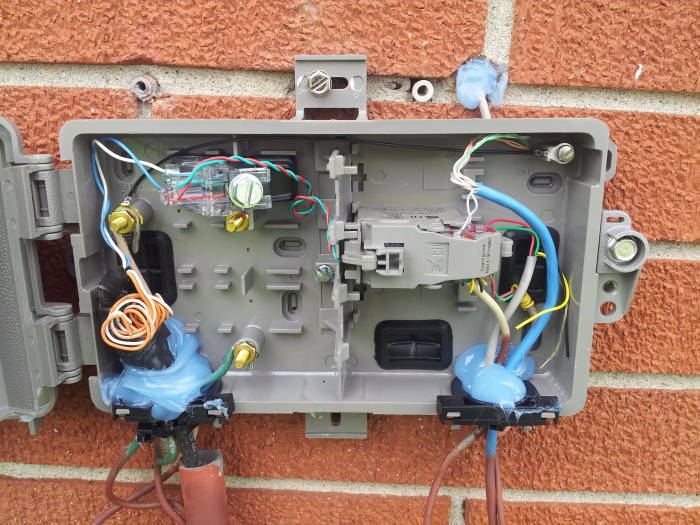 From there on into the house, including the medium-sized green box and the small grey box, and all the wiring within the house, that's the responsibility of the property owner. Or, while the line down the street arches from pole to pole, the drop might go down the pole and underground, running through a slit cut in the lawn to the foundation, and then either through the foundation into the basement or up the exterior wall. 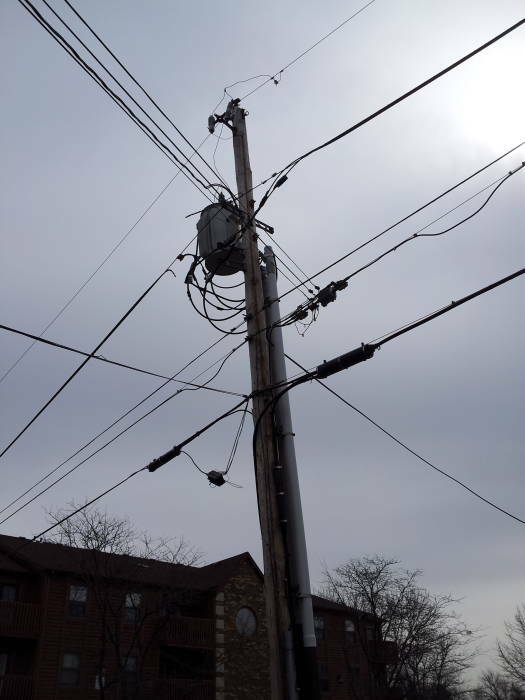 That's what we see below, where the electrical power line, cable, and voice/DSL lines run down the pole, the lower sections protected by a plastic shield. 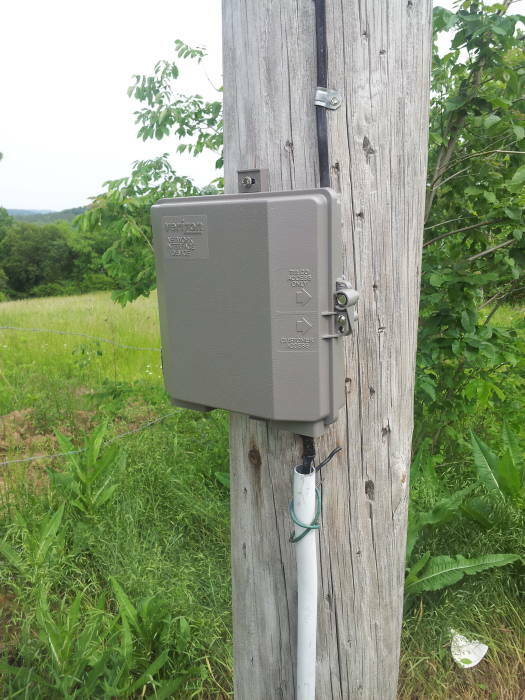 Here is a Verizon interface box on the pole at the road. 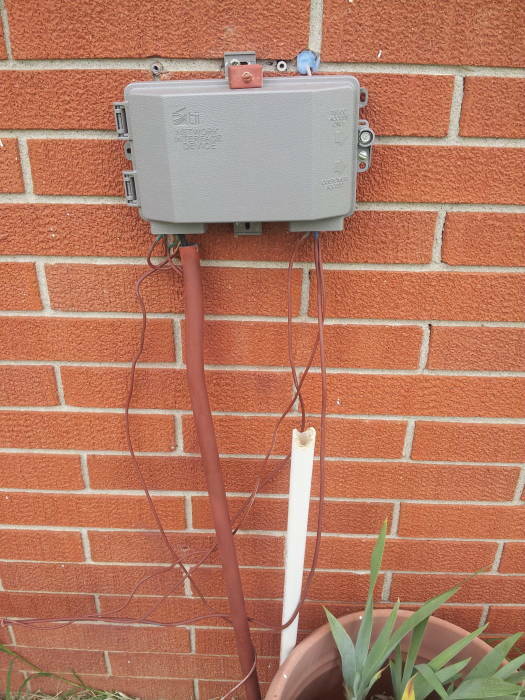 The drop comes down the pole and into this box, where connections can be made to a buried line running to the house. The line below the interface box runs through a piece of PVC tubing or thin walled pipe to protect it from damage. 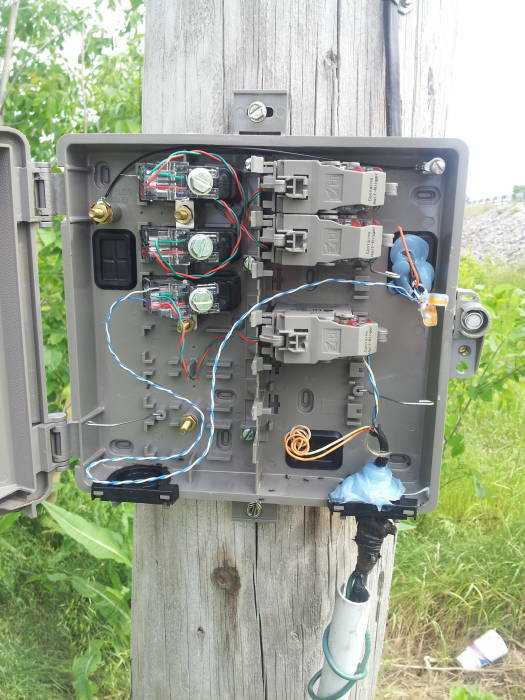 The last picture above shows the interior of the Verizon interface box on the pole. The buried line exits the box at lower right, we can see that it contains multiple twisted pairs. The old voice-only drops only needed to carry baseband audio, so a simple conductor pair was adequate. The old one shown here is made with copper-coated steel conductors so it can suspend itself for an overhead drop. But DSL needs twisted pair signaling lines to support the much higher frequency signals. Finally, the line down the street might be underground and come up into a pedestal where the "drops" to nearby households connect and run back down underground and to the homes. Both pictures below show pedestals. 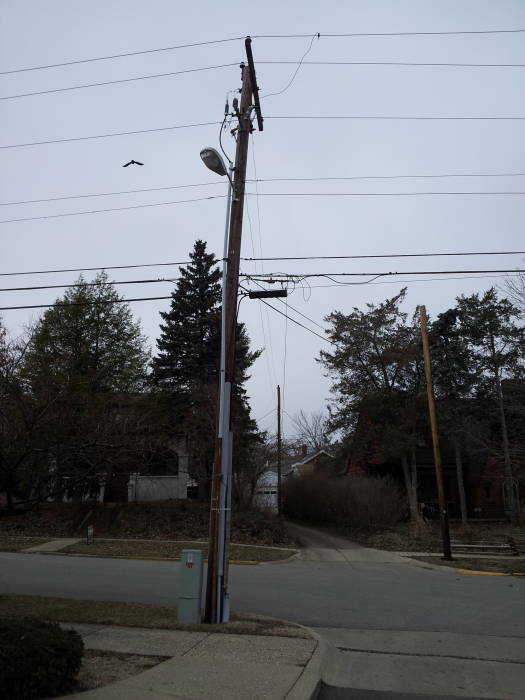 The pedestal at in the first picture is at the base of the utility pole, the drop comes down the pole. 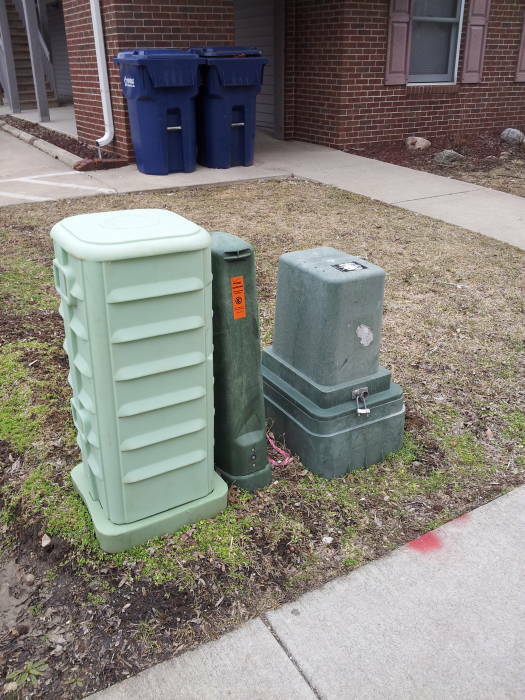 The second picture shows a cluster of three pedestals for underground lines. 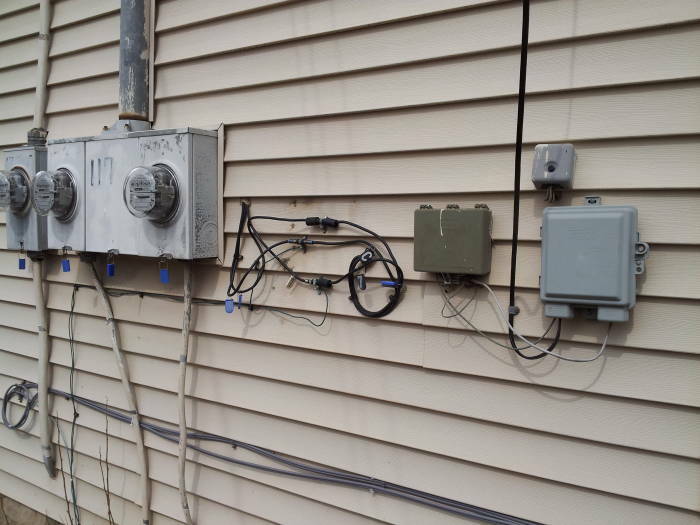 From left to right they're for Comcast/Xfinity, Verizon, and Frontier. 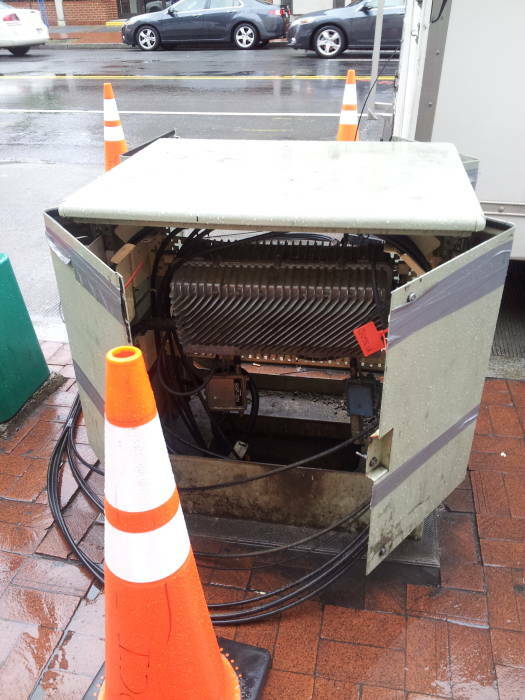 Pedestals and similar boxes may contain large block amplifiers, like this Verizon unit on H Street between 6th and 7th Streets in Chinatown in Washington D.C. The telephone company's line comes up out of the ground through a plastic conduit into the NID. The NID has been opened to attach the blue Ethernet cable. The drop from the phone company line runs from their system to the Network Interface Device or NID. The network interface device is typically a drab plastic box on the exterior of the house or in the basement or otherwise in the utility entrance area. It's the phone company's property and responsibility right up to the network interface device. From that point onward, it's all yours. The phone company's line consists of a two pairs of wires. Each pair is typically considered as part of a loop, connecting a two-terminal device at the customer's end to a two-terminal device at the phone company. It was literally a loop years ago, now it is more likely to behave much as though it were a loop without literally being one. The two wire pairs are considered, again for historical reasons, as the ring and the tip, referring back to when the ring and tip of an electrical plug were connected to the two lines. That gives us Tip 1 and Ring 1 as the two wires of pair #1, and Tip 2 and Ring 2 as the two wires of pair #2. The two pairs are colored, blue/white for pair #1 and orange/white for pair #2. Practically speaking, the wires of pair #1 are blue with a thin white stripe, and white with a thin blue stripe. 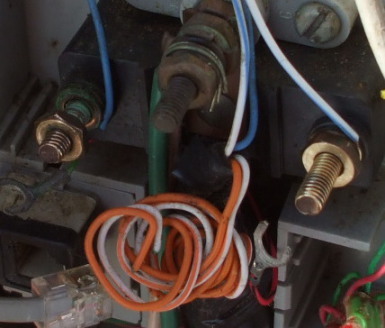 Similarly, the wires of pair #2 are orange with a thin white stripe, and white with a thin orange stripe. For most homes with a single line, pair 1 is used and pair 2 is an unused spare. You can then easily add a second line by connecting pair 2 where the drop ties into the line, and then using the T2/R2 pair within the house. 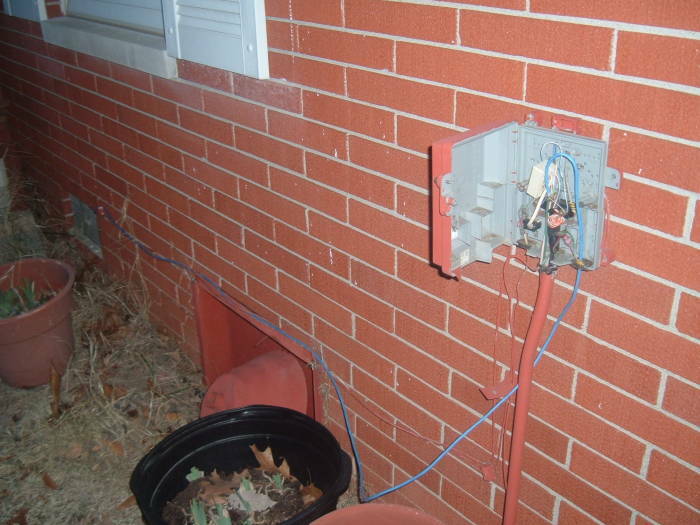 Most residential phone wiring in the U.S. during the mid to late 1900s used four-strand wire within the house, with individual wires in insulation colored green, red, black, and yellow. This four-strand wire would support two separate lines. But the overwhelming majority of homes had just one line. The standard first phone line used the red/green pair, red for ring and green for tip. The far less commonly used second line would use yellow/black, yellow for ring and black for tip. 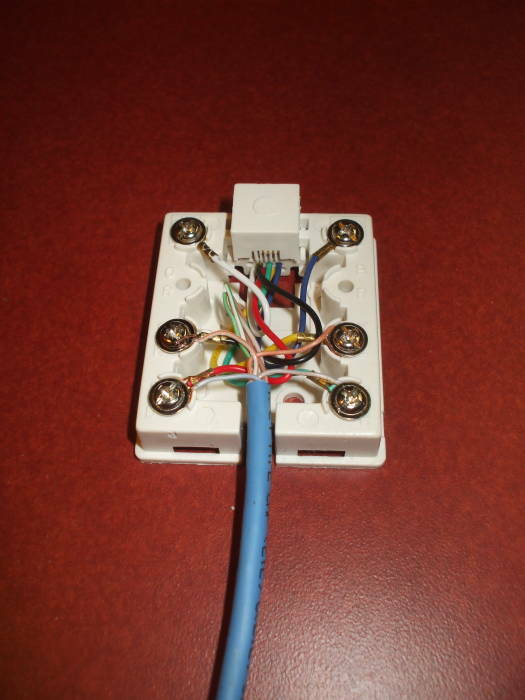 New telephone wiring projects should use quality twisted-pair cable like that used for Ethernet. Category 5 cable should be fine, Category 6 would be overkill if we're just using voice plus DSL. Category 5 has good performance up to 100 MHz, 5e has a tighter crosstalk specification. When you're connecting Ethernet cabling at the NID or network interface device, match its wire colors to the telephone company's. White-with-blue to white-with-blue and so on. 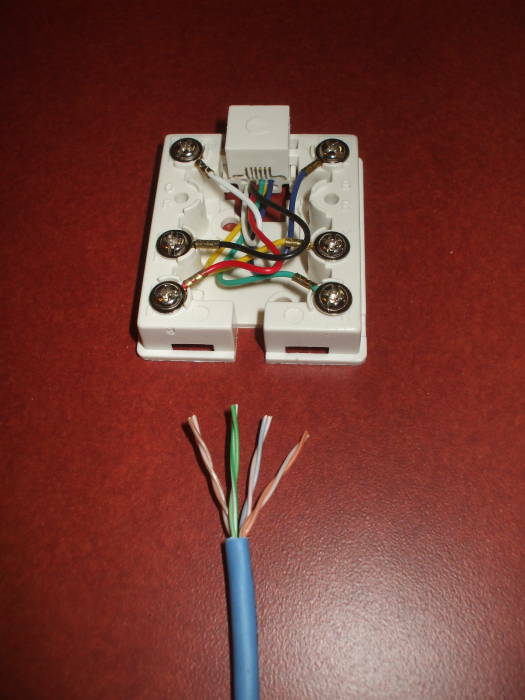 When you're dealing with legacy wiring already in place within the house, use the color matching shown above. 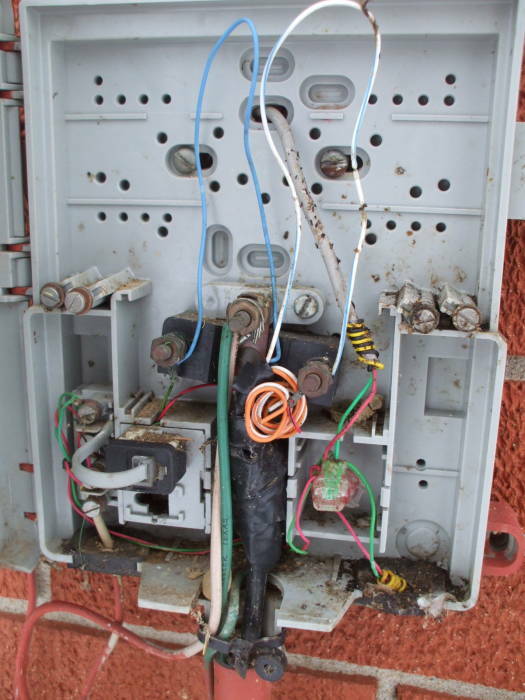 We have opened the telephone Network Interface Device to find dirt, debris and old wasps' nests. The phone company's line comes in from the plastic conduit at bottom. That conduit has been painted a brick-red color. 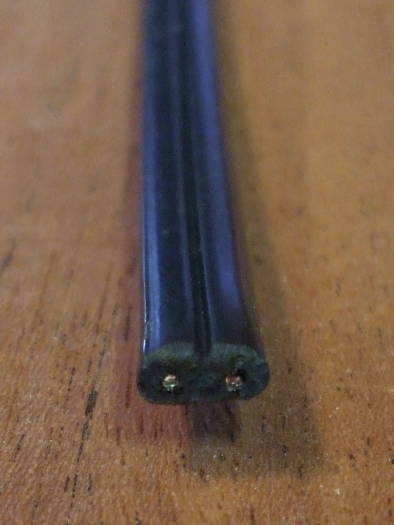 The end of the part of the cable retaining its outer plastic jacket is wrapped in black electrical tape. Wire pair #1 loops up to the top of the box and back down. This pair is blue with a thin white stripe, and white with a thin blue stripe. Wire pair #2, orange and white, is coiled near the end of where the jacket has been cut away, where the electrical tape is wrapped around the last couple of inches of outer jacket. 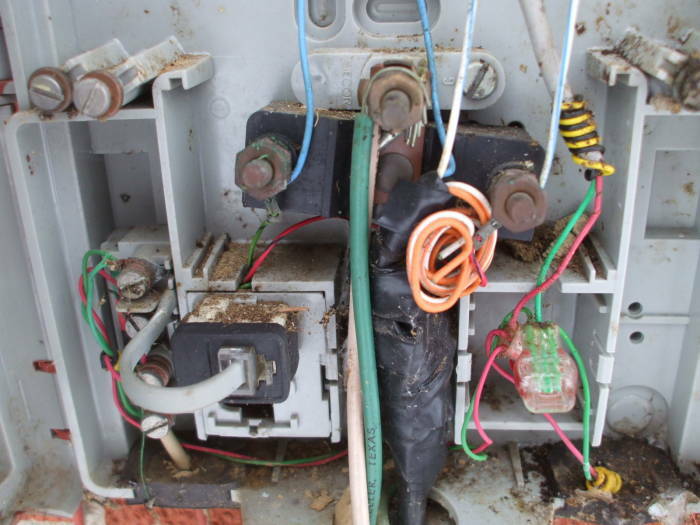 Wire pair #1 is connected to terminals at either end of a black plastic block. The central terminal is the ground, where you connect the heavy green jacketed wire from the phone company and the heavy wire, here with a beige jacket, leading to a ground rod. 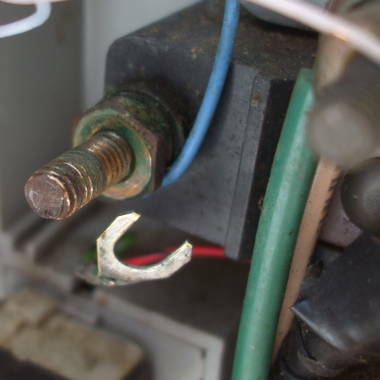 A red/green wire pair with slotted spade lugs connects to these two terminals, leading down just a few inches to a modular jack. There, a 4-conductor cord just a few inches long has a modular plug on one end, and at the other end leads to a 4-terminal block. This allows you to unplug that short modular jumper and connect a phone, testing the connection out at the NID. The screw terminals at lower left are where the lines leading into the house connect. Telephone calls to this house could be frustrating with all the noise on the line. Hissing, crackling, popping. There was an old FAX machine plugged into one extension jack and a dysfunctional answering machine on another, but I think that the corrosion in the network interface had quite a bit to do with all the noise on the line. We disconnected and threw out the broken old FAX and answering machine, and then I cleaned the terminals in the network interface. That solved the noise problem! The brass posts, nuts, and flat washers were heavily corroded. I unscrewed the nuts and removed them and the flat washers, and then cleaned each post by wrapping fine steel wool around it and twisting it back and forth. I also cleaned the faces of the nuts and the flat washers. The posts just go into a heavy plastic block. They aren't really the connection itself, they allow the connection to be made by using their threads to press the wires, flat washers, and nuts together. I have cleaned and started reassembling the right-side post. The post on the left still needs lots of attention. A Better Solution: Replace the Network Interface Device! A much better solution is to simply replace the network interface device! This one was replaced by the phone company, complete with their light blue sealant. The left side of the box is the telco side. The consumer's side is on the right, where you can connect to the terminals provided by the telco. The normal voice calls use a narrow band of audio frequencies, just up to about 4 kHz. The DSL data signals are at higher frequencies. We have to send the DSL data signals to the ports where DSL modems and computers will be installed, while preventing the DSL signals from causing interference to the telephones. So-called DSL network connections are typically ADSL or Asymmetric Digital Subscriber Line. The asymmetry is the difference between the upstream and downstream bandwidth. Put simply, you can pull data into your home much faster than you can push data out of it. That's just fine for most users, as you prefer that your downloads and live streaming have the greater bandwidth. Upstream traffic like sending e-mail might go a little slower, but you're not typically concerned because you aren't being inconvenienced. Typical ADSL systems use frequency ranges like those in this table. This provides close to 1 MHz of bandwidth for the downstream (Internet to house) signaling and a little over a tenth of that for the upstream (house to Internet) signaling. The lower end of the data signals would cause a lot of hissing noise if you tried to make a call while the DSL moden is powered up. You need a DSL filter, which is just a low-pass filter. There are two ways of filtering the phone signals in a DSL setting. The first is to install a DSL filter at each telephone. Each filter is just a little module with a very short cable; you plug the filter into the jack and then plug the phone into the filter. An alternative would be to build one filter like the one shown here. Connect its network side to the network interface, and connect all jacks for voice lines to its phone port. The DSL signals will be blocked on those ports, so you can only connect the DSL router and computer to unfiltered jacks. The circuit shown here is the classic one, but the component values aren't critical. The inductance and capacitance values could be anywhere from what's shown here through at least 2 times these values. Do make sure that the capacitors are rated for at least 200 volts, as the ringer voltage is a series of pulses nominally about 80 volts. You need to run Ethernet cabling from the network interface to at least the one jack where the DSL modem and computer will be installed. This might be a convenient time to re-wire other phone jacks, and you might as well use Ethernet cabling for that. First, strip back the outer jacket and separate the four wire pairs. You will find blue, orange, green and brown pairs. Each pair is a twisted pair of wires, one that color with a white stripe and the other white with a colored stripe. 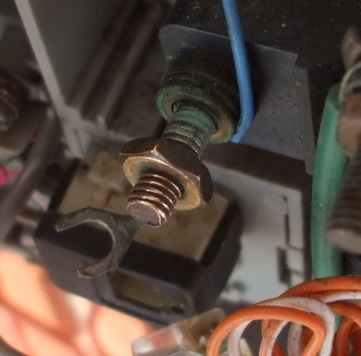 Test your jacks as you wire them in. Remember to use a DSL filter everywhere except where you connect the DSL router. When you're ready to test the Internet connection, remember that you do not use a DSL filter there! Use the links at right if you want to learn more about networking and how your home now connects to the Internet. The logic of IP routing relays data packets hop by hop from your home across the Internet. NAT or Network Address Translation lets you connect several computers to one DSL router, while protecting all of them from active probes from outside. Also check out the introduction to Internet security. Do not place them where this one was in Herndon, Virginia. It was right along a road winding through office parks, where the anxious commuters hit speeds around 50 m.p.h. despite that being almost twice the posted limit. And especially not where a sidewalk ramp makes it so easy to drift off the road while texting and smash into the poor pedestal. At least the pedestal slowed or stoped the car enough to protect the tree.